It's pretty much a given that your new vinyl replacement windows will be more energy efficient than your old ones, especially if you're switching from single pane to dual pane windows. When shopping for new windows, you will be bombarded with terms and numbers that indicate just how energy efficient your new windows are. It can be very confusing, so here's a brief rundown of the terms you should know. 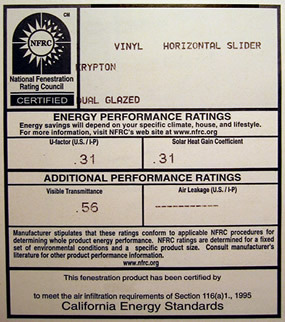 The NFRC label displays the energy efficiency rating of your windows. The U-Factor tells you how quickly heat can escape through your window. Since you want a window that insulates well, a lower U-Factor number is generally better. Most windows have a U-Factor between 0.20 and 1.20. The R-Value measures how well a window performs as an insulator. A higher R-Value means better insulation, so you want to look for a high number. The R-Value is the inverse of the U-Factor. The SHGC number indicates the window's capability to block heat from the sun. Ratings range from zero (the best) to 1.0 (the worst). This is a measure of how much light gets in through the window. The higher the VT number, the more light you will see. VT ratings range between zero and one. A zero means the window would let in no light. The Air Leakage rating tells you how much air gets through the window. A lower number is better. Some companies offer an insulating layer of argon gas between the panes, usually for an extra fee. Argon is a very heavy gas you cannot smell or see. It can do the job, but you'll have no idea if it will leak out over time since it's invisible. "Low-e" means low emittance of energy. A low-e coating is a nearly invisible metallic layer on the glass that reduces the flow of heat. They keep hot air out in the summer and cold air out in the winter. Most modern vinyl replacement windows include low-e coatings to increase energy efficiency. NFRC stands for the National Fenestration Rating Council. It is a non-profit organization created by the window industry to develop a standard way to rate energy efficiency. When you get your new windows, you should receive a label detailing various aspects of your windows' energy efficiency. The label is the best way to know you're getting what you paid for and to compare the efficiency of different windows. Don't buy vinyl replacement windows unless they come with the NFRC label. Energy Star is a US federal government program designed to help consumers find energy efficient products. For vinyl replacement windows, the Energy Star program relies on the U-Factor and solar heat gain coefficient ratings supplied by the National Fenestration Rating Council (NFRC). To qualify for Energy Star, vinyl windows must meet certain criteria that vary depending on your geographic location. Buying an Energy Star window takes some of the guess work out of the process. It means that the government has given the window its seal of approval for energy efficiency. If you don't want to take the time to learn about the numbers on the NFRC label, looking for and Energy Star window is a quicker alternative. © Copyright 2019 VinylReplacementWindows.org. All Rights Reserved. Need a new roof? Visit our sister site: RoofingHelper.com.